It’s the viral photo that just won’t die. 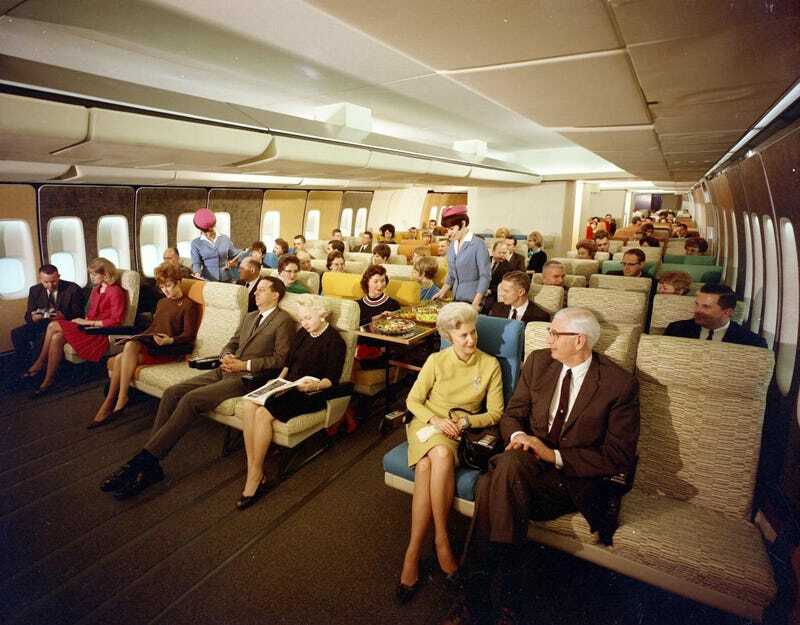 Have you seen this 1960s picture of economy class seating on a Pan-Am 747? It’s a fake. How can the photo be fake? The cabin is actually just a mock-up made by Boeing in the 1960s to demonstrate what one of their planes might look like one day. The models in this photo never left the ground. Yes, planes were certainly more roomy back in the 1950s and 60s. But they were also incredibly expensive, painfully slow, and often discriminatory. Even the promo photos above showed only white people. Legendary black singer Ella Fitzgerald famously filed suit against Pan Am in 1954 after getting bumped from a flight for a white passenger. The color version of the “1960s economy class” photo appears above, but more commonly people like to share the black and white version. Maybe it feels more old-timey in black and white? I really don’t know. We even debunked this one back in 2013. But that hasn’t stopped countless people from sharing it recently — including Twitter accounts like HistoryInPics and OldPicsArchive. Every couple of months or so it seems to do the rounds anew on Twitter and Facebook. So what did economy class seating actually look like when the Boeing 747 took off? The photo below shows what flying really was like back in January of 1970. A bit nicer? Sure. But it’s not quite the accessible, luxury experience that people what to romanticize it for being today.